Always intrigued by a new golf apparel company. L.A. based, Devereux seems to have the right fabrics and colors headlining its very stylish offerings for 2014. They've already showed up on Golf Week's 13 Holiday Gift Ideas for Golfers. I've posted a few pictures below but more can be found on their website; dvrxgolf.com. Looks like they're pretty new to Twitter and can be followed on Instagram as well. What do you think of the style/look. I'm liking the cool Signature pocket by Devereux. LOS ANGELES, CA -- Meet Devereux, a contemporary new line of men's apparel that gets golf. The brainchild of Robert and Will Brunner, brothers and avid golfers, the Devereux collection is premium-quality modern menswear that fits the avid golfer's lifestyle while keeping him in-style and authentic. Devereux is known for simple-yet-sophisticated pieces in contemporary colors and with superb attention to detail. Clean modern styles are designed to fit properly and inspire performance, both on and off the course. Specifically tailored to move seamlessly from workday to weekend and beyond, the Devereux line is all about modern sophistication, everyday elegance and simple versatility. These are the clothes you can wear confidently, comfortably and above all - they make the male golfer look as great as they make him feel. Robert Brunner, Co-Founder and Creative Director said, "We understand the fashion challenges faced by men today, because we feel them too. Whether out on the course or out on the town, you want proper threads." Brunner added, "We went looking for clothes that could bridge the gap between modern men's fashion and progressive golf styles, but we came back empty-handed. So we set out to create what we could not find - the stuff legends are made of." The primary inspiration for this line was the great players and dressers of the game such as Hogan, Palmer, and Player. Through the years, you have seen golf fashion evolve into what it has become today. Devereux was inspired to introduce a more contemporary golf line, while touching on previous fashion statements made on the course years ago. Devereux uses a unique blend of Pima Cotton/Polyester. The natural (Pima Cotton) and synthetic (Polyester) fiber blend combines the best of both fiber characteristics and has easy care qualities. This is a blend that has a resilient look as well as a high performance functionality. Devereux sweater knits use a blend of Pima Cotton and Baby Alpaca. This is a wonderful blend that brings out the best qualities of both fibers. Baby Alpaca adds a nice luster, and perfect insulation qualities, to the already desirable Pima Cotton. Devereux also offers a Pique, which is a Pima Cotton and Spandex blend. This fabrication has a great cooling effect due to the Pima Cotton, and with the addition of Spandex, the Pique retains its resiliency and shape. In tribute to some of the great golfers of the 1960s, 1970s and 1980s, Devereux has developed a signature pocket that offers a unique, abstract shape. 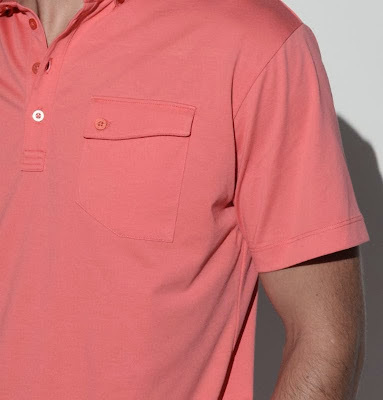 This signature pocket can be found on the Brunner and Welch golf shirts from the Spring 2014 Collection. The Essentials Collection offers men a strong foundation to build their wardrobe upon. They are found in the Essential colors Caviar (black), Steel, White and Navy. Devereux is offering Steel as its primary base color. The Essential Golf Shirts come in two styles: the Brunner and the Lindle. About Devereux - Founded in 2013 in Los Angeles, CA, Devereux is a premium, contemporary line of men's golf wear. Offering men "Proper Threads", Devereux provides style and comfort on and off the course. The Devereux collection can be found at better clubs, resorts & specialty retailers abroad. To view the collection, visit dvrxgolf.com.